Few states can beat Louisiana when it comes to cultural assets. What other state can boast its own indigenous music, its own cuisine and such well-preserved historical jewels like the Vieux Carré, arguably one of the biggest outdoor museums in the country? are a rich natural resource that can bring jobs, spur new investment and give Louisiana a leg up in the global marketplace. This month, he’ll host the fourth annual Louisiana Cultural Economy Summit in New Orleans. The summit, planned for October 29 and 30 at the Royal Sonesta Hotel, will feature internationally and nationally known speakers, professional development seminars and smaller sessions to give cultural workers practical tools to build their ventures. The event coincides with Landrieu’s World Cultural Economic Forum, which brings together leaders from across the globe to discuss the intersection of culture and commerce. 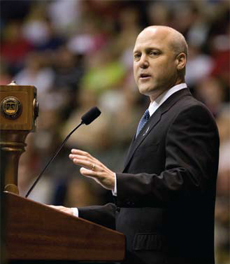 New Orleans Living recently chatted with Lt. Gov. Landrieu about the summit and the overall state of the cultural community in New Orleans. How did the Cultural Economy Summit get started? The Cultural Economy Initiative was designed to try to create more jobs out of Louisiana’s raw talent. There are over 144,000 jobs in Louisiana that are tied to art, music, historic preservation, architecture, the film industry and live theater. The idea that I had is that if you treated it like a business and grew it just like we tried to grow the maritime industry or the oil and gas industry, you could actually create many, many, many jobs with less money over a longer period of time. This has grown well beyond that to include an international component with the World Cultural Economic Forum. How many countries are involved? Last year we had 70 different countries represented. And so Louisiana is kind of the focal point of the discussion internationally of how cultures intersect with regular economic models and how different people can come together to use culture to create economic development. So it’s been a huge success. We are also going to have fairly high-level officials from different governments who will be having sidebar meetings with folks in Louisiana where their countries are doing business with us. How is this summit an opportunity for local businesses? For any business in Louisiana that is working oversees or in another country, it gives them the opportunity to talk to government leaders and business leaders from that country and find a way to add value to the jobs that already exist. Also, there are a huge number of workshops that are going to bring together experts in [creative] fields. They are going to talk about the trials and tribulations, the successes and the challenges that they have had. The third piece is the networking opportunity that inevitably results in new partnerships. This has been a difficult year for many industries because of the recession. Are arts ventures more vulnerable to economic downturns? The cultural industries certainly don’t live in isolation. They are generally affected the way the rest of the economy is affected. What’s ironic though about some of the cultural aspects and the tourism aspect is that tourism has done better in Louisiana than anybody had expected it to do. The film and television industry, which the state lured with tax credits, seems to also be going strong. We went from doing a $30 million book of business to doing an $800 million book of business last year. The big message there is that if you treat it like a business, then it will act like a business. One of the panels at the summit is about arts education. There is a new state law that mandates the implementation of arts education programs in public schools by next year. Why is this important? Every major study on education usually indicates that if arts and music are part of the curriculum then math and science scores go up. It’s critically important that if Louisiana has an economic advantage because of its indigenous culture that we actually teach it in schools. You really have to make sure that you fund culture. It’s a critical part of what makes us so special and unique. It’s our authentic culture that gives us a competitive advantage in economic development. This year’s summit is right before the big Halloween weekend and the Voodoo Experience festival. Is it any coincidence you’re timing it around a big cultural event? Last year, Prospect 1 started the week after. You always see us trying to do it when lots of folks are around and it’s part of a major cultural season, so it works out well for us.